Shows different prices according to the user?s group. Special discounts for commercials, wholesales, Premium ? 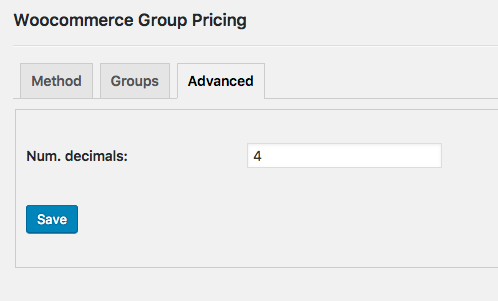 Check the settings on the Woocommerce > Group Pricing submenu and adjust them. You can select between rate or amount method. This discount is applied for each product. Leave empty if no group discount should be applied (default setting). 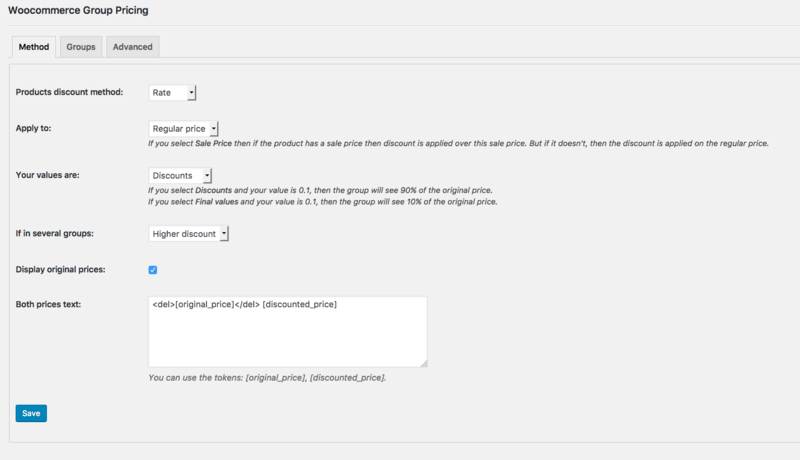 Example with rate method: Indicate 0.1 for 10% discounts on every product. 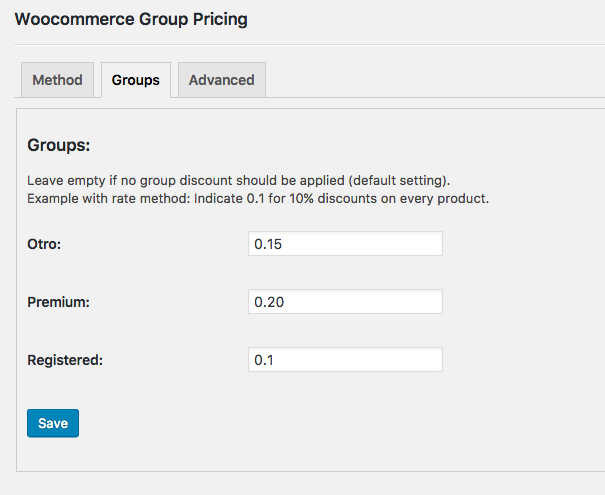 If you need to have a custom discount by product, you can set the value in product’s page “Groups pricing” tab. Leave empty if this product doesn’t need a custom discount (default value will be used). Muestra distintos precios a tus clientes según al grupo al que pertenezca. Aplicando descuentos por grupos, podrás dar un servicio personalizado a tus clientes. Crea grupos de ?Comerciales?, ?Distribuidores?, o los que necesites. Así ellos podrán ver la web directamente con los descuentos aplicados, sin necesidad de cupones o terceras soluciones. 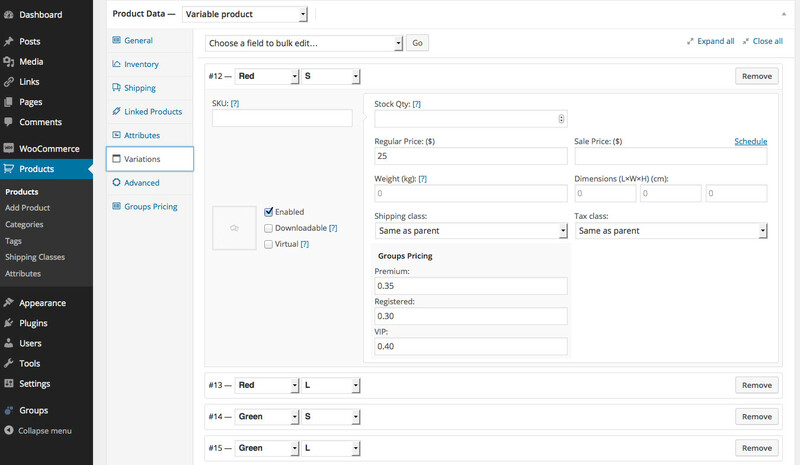 - Now you can set discounts or final prices as values. - Fixed: commission calculated when rate is selected and commission is set to zero. - Fixed: display both prices in admin screen. - Added textarea when you can set the text when both prices is shown. - Fixed original price displayed when the discount is not applicable. -Added option to display the original and discounted prices. -Fixed 'Save Changes' action in variable products. -Added 'if in several groups' option. 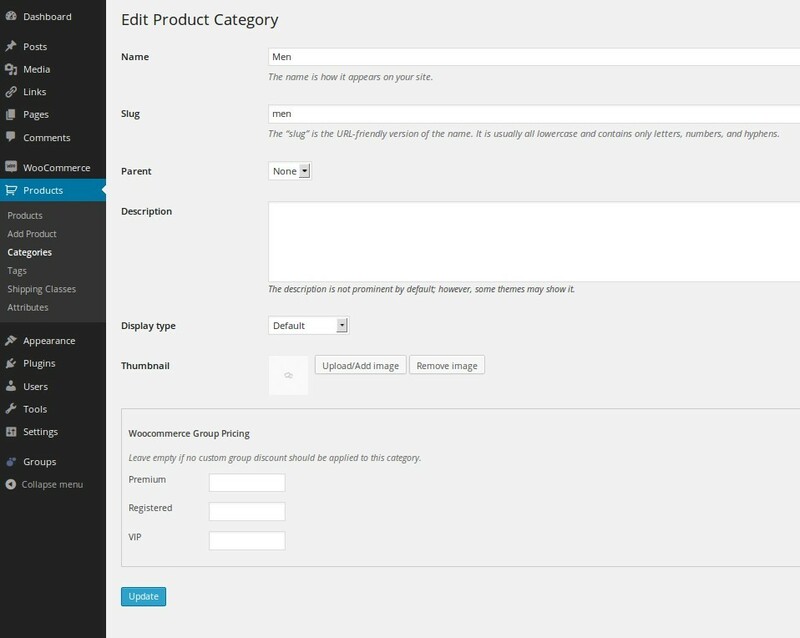 Now you can select a criterial if the user is in multiple groups. -Improved the fields format in dashboard. -Added [wgp_show_discount] shortcode to show the user discount. -Fixed: the original variable products price are no longer displayed. -Fixed sales price if user hasn't discount. -Added the ability to apply the discount on the regular price or on the sale price. 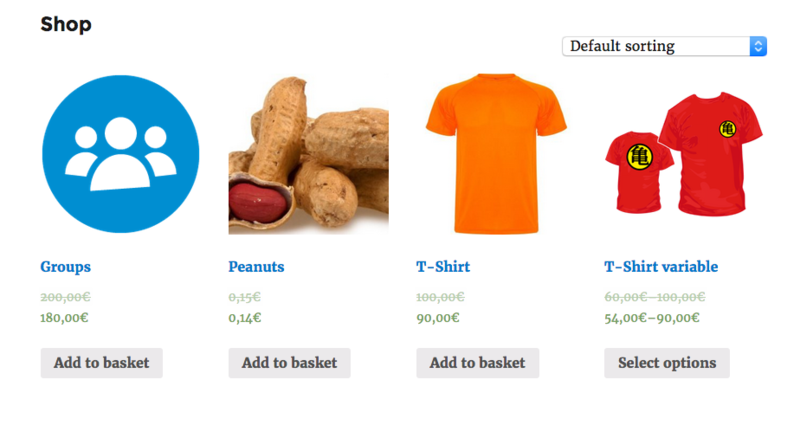 -Added support to set different discounts by products. -Fixed support to old php version (BCMath library).